This book was chosen on the basis of the title alone. It is packed full of “fun facts” and “did you knows.” Have you ever wondered where language starts, why we say the things we do, where it all comes from, and how the meaning of the words have changed over the years? For example, in today’s world when you call someone a louse you are in essence calling them an obnoxious person; but, during the Elizabethan Era, you are literally saying that they are covered in lice. Another example is how in today’s society; we have little problem insulting someone with accusations of sexual promiscuity, however, In the Elizabethan Era, this almost never happened because in accusing a married woman of loose morals you were damaging the reputation of her husband and questioning the legitimacy of her sons. Doing so created the risk of the men in the family taking you to court where you would have to prove your accusations. If you failed, you would have to pay a hefty fine and make a public apology. In many cases, men can be guilty of the same transgressions as women but not suffer any consequences. It would be looked upon as a mere annoyance. If a woman committed similar transgressions or did something as mundane as wearing BUTTONS, they were viewed as mocking Gods law. 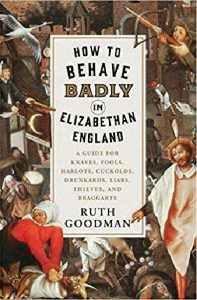 In Ruth Goodman’s book, “How to Behave Badly in Elizabethan England,” the author explores the origins of offensive language and gestures in an objective, enjoyable and educational way. She discusses how insults both verbal and nonverbal have changed since the Elizabethan Era. She talks about how cleanliness and meal etiquette were standards for most, showing that certain standards were expected of everyone. Yet, by not following these standards in small ways, like house maids wearing ruffles, it was considered an insult by a rebel trying to attack their elders. Goodman added a number of illustrations throughout her book showing how by bowing improperly at someone was an insult. Goodman focuses on everything from language, nonverbal gestures, and the insult of quoting Shakespeare in public. Goodman’s book is fun to read, easy to relate to, and historically accurate. It is presented in a way that makes it seem like you are reading a gossip magazine. It is full of laughs and surprises, and it gives the reader a better understanding of life in the Elizabethan era for those people who were not members of the court. Her book opens roads into parts of history most do not venture down. It shows that although the meanings have changed slightly; we are not all that different from those people of the past. This book can be found in the General Collection at the Bellevue University Library and can be checked out for 21 days.